I certainly didn’t. But here we are, me typing this the day after I read the new Star Wars #1. 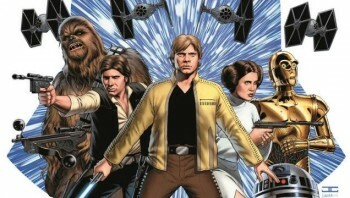 I usually don’t read comic books, but maybe these new Star Wars comics will offer some foreshadowing for the new movies. It’s set in between A New Hope and Empire Strikes Back, and I think it’s worth a read. Check it out wherever you usually get comic books! Anyway, on the show this week I talked about the four movies I watch over the weekend. Black Hawk Down, Chinatown, Blade II and The Talented Mr. Ripley. All four are on Netflix, and you should check out all of them–they are very entertaining and well done. Chinatown is actually considered one of the best written movies of all time. If you want to do a book club thing, I’m currently reading the script–read along with me! Anyway, let’s see what’s good on the webs this week. Check out this awesome montage of action movies put together by Vimeo user GameOvais. It’s pretty cool, and shows just how formulaic trailers actually are. I never really liked Boy Meets World. I didn’t grow up watching it, so I didn’t have that nostalgia for it that some people have. So this mash-up trailer doesn’t do too much for me–but maybe if you’re into that show you’d like this? And a turn for the informative–check out this video that highlights the importance of film colourists to a movie. They take shots of A House On Pine Street and show what goes in to making colours pop. And that’s it for me this week. Keep watching movies and keep that popcorn popping!